Text to speech is bound to become a more popular feature in upcoming computer systems in the years to come. It has been around for quite a while, but most of the current software available is not quite up to scratch. Have a play with it before it becomes commonplace, with Ultra Hal’s Text to Speech Reader(UHTTSR). UHTTSR is a utility that runs in your task tray that will convert text to speech. UHTTRS will read out anything that you copy to the clipboard. This way you are able to read out just about any text that confronts you. Web pages and documents can all be copied to the clipboard easily. You can then save the spoken text as a wav file for playback later. A simple MP3 conversion using another program will allow you to get the file over to a mobile device. If you use AIM, ICQ or MSN messengers, UHTTRS may be very useful to you. As a new message arrives, UHTTRS will automatically read them out aloud to you. This lets you stay away from your computer until you want to reply. The results aren’t very good with the default voices that come with Windows, but there are more free voices available that sound much better. Check out this Inspect My Gadget article to find out more. 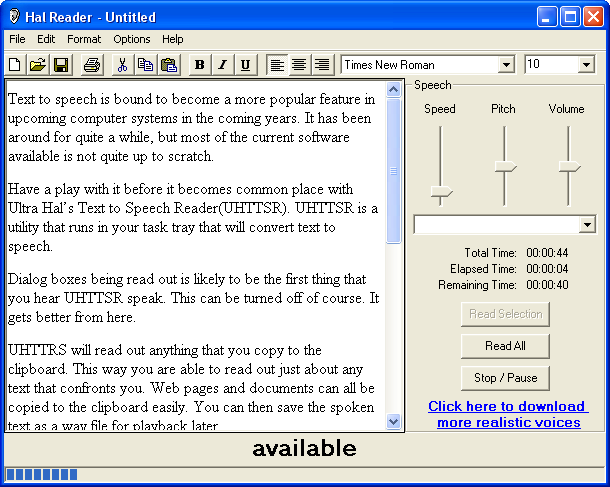 There are a lot of commercial text to speech options available. TextAloud was recommended to me and it looks great. I am surprised there aren’t a great deal of free options out there as I used to enjoy playing with text to speech programs when I got my first Sound Blaster 16. 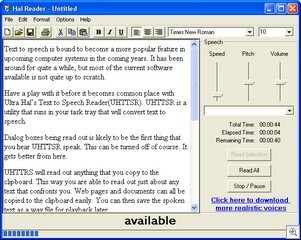 Ultra Hal Text to Speech Reader is available for free from Zabaware. Windows Software: Update your computers voices.